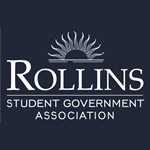 The Rollins College Student Government Association (SGA) represents the interests of students in the College of Arts and Sciences and College of Professional Studies for the purpose of participating in the governance of the College. It consists of four senators from each class and representatives from various student groups. Senators sit on faculty committees, including Academic Affairs, Finance, Professional Standards, and Student Life. SGA meetings are open to anyone on campus and take place weekly each semester. The Student Government Association collection in Rollins Scholarship Online comprises three series: Governance Documents, Legislation, and Meeting Minutes. Additional holdings documenting SGA business and activities can be searched in the Archival Collections Database: http://archon.rollins.edu. The Rollins College Web Archives began periodic captures the SGA website for preservation purposes in 2013. Captures can be found at https://wayback.archive-it.org/4229/*/http://www.rollins.edu/sga/index.html.